Vegans are a type of strict vegetarian who excludes meat, fish, eggs, dairy, and other animal products from their diet. The average parent who is an omnivore (eats everything) often cringes when their child decides to become a vegan or other type of vegetarian, wanting their pediatrician to talk their child out of it. Will their child get enough vitamins and calories being a vegan? Don't kids have to eat meat to get enough protein and iron in their diet? 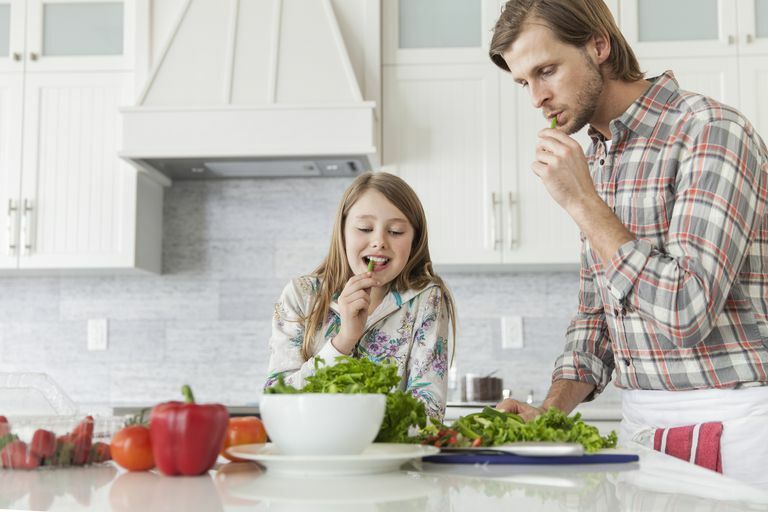 Fortunately, since your pediatrician would likely have a hard time talking your teen out of these types of diet plans if she tried, a vegetarian diet can be healthy for most kids. Although not for everybody, a vegan diet does indeed have many health benefits, and if well planned, can be a healthy diet for kids. Parents, especially if they are vegans, can also feel reassured that they can raise their kids to be vegans too. Children raised on a vegan diet are not sick less often than other kids. Non-vegan foods are not full of toxins and pesticides. Not all vegetarian foods are healthy, some are high in sugar, saturated fat, or cholesterol. The foods that are part of a vegan diet are typically low in cholesterol and saturated fats and they are high in fiber (all characteristics of a healthy diet) and may lead to a lower risk of obesity, heart disease, high blood pressure and Type II diabetes. Vegetarians typically also have lower BMIs than non-vegetarians. These health benefits led Dr. Benjamin Spock, back in 1998, to recommend a strict vegan diet for all children over the age of 2 years. The last edition of his iconic parenting book, "Baby and Child Care," published shortly after he died, advised that children shouldn't be given dairy products after they are two years old and that they "can get plenty of protein and iron from vegetables, beans, and other plant foods that avoid the fat and cholesterol that are in animal products." Dr. Spock's proposal created a lot of controversies, but not because experts disputed the health benefits of a vegan diet, but rather because they thought that parents might not take enough time and effort to plan a vegan diet that included enough calories, minerals, and nutrients to ensure optimal growth in their children. And they likely thought that children would have a hard time following the diet too, especially when you consider that most parents already have a hard time getting kids to eat enough fruits and vegetables. When you look at the latest statistics, only about 5% of people are vegetarians and only half of those people are vegan. And the great majority of vegans and vegetarians, 70 to 86% respectively, eventually backslide and return to eating meat. Since many kids can already be picky eaters, restricting their choices even further can make it more difficult to meet nutritional needs with a vegan diet. This is especially true for infants and toddlers. Vitamin B12. This vitamin is only absorbed from animal products, so your child will need to take supplements or eat foods that are fortified with vitamin B12 (also called cobalamin), including fortified soy milk, fortified cereal, and some meat substitutes (read food labels). Nutritional yeast is another way to get extra vitamin B12 in your vegan child's diet. Omega-3 fatty acids. These are essential fats that our bodies must get from our diets and are among the fish oils. You can get some from plant oils too, in addition to fortified soy milk, fortified cereals, dark greens, and nuts. Iron. Most parents recognize that meat is a good source of iron. How else can kids get iron in their diet? In addition to iron-fortified foods and a supplement, vegetarians can get iron from beans, greens, tofu, vegetables, dried fruits, and other iron-rich foods. Keep in mind that it is harder for the body to absorb the nonheme iron that is found in fruits, vegetables, and grains, than the heme iron that is found in red meats, poultry, and fish. Vitamin D. This vitamin is present in fortified milk, egg yolks, and fish. Your body also makes vitamin D when exposed to sunlight, but that isn't a reliable source, as kids should be using sunscreen that blocks this process. Calcium. Having a diet with foods that are rich in calcium to meet daily requirements is necessary for the development of strong bones. It is also an important way to prevent the development of osteoporosis in adults. Many vegetables contain calcium, especially broccoli, sweet potatoes, great northern and navy beans, and leafy greens. You can also give your child soy milk or orange juice that is fortified with extra calcium. Zinc. Your child may need to take supplements or eat foods that are fortified with zinc to get enough of this important mineral since the best sources of zinc are meat and yogurt. Zinc is also found in whole grains, brown rice, legumes, and spinach. Calories. Vegan diets may have fewer calories than diets that include meat and dairy products, but for the average child, that could be a good thing in this day of high rates of child obesity. Although it isn't necessary to count calories each day, you should ensure that your child is receiving enough calories for their optimal growth. In general, if your child is eating a well-balanced and varied vegan diet, is gaining weight and developing normally and is active, with a lot of energy, then he is probably getting enough calories. Protein. You can make sure that your child gets enough protein and amino acids by eating a good balance of whole grains, legumes (beans and peas), nuts, and soy products. Folate. Vegetarians don't often consider folate as a nutritional concern because green leafy vegetables are a good source, but since a folate deficiency can hide the signs of a vitamin B12 deficiency, it is important to get enough. Folate can also be found in many fortified foods, including orange juice, breads, cereal, and pasta. Still, just because it might be a little harder to follow a vegan diet than simply feeding kids hot dogs, chicken nuggets, and other kid-friendly foods don't mean that you shouldn't do it. Providing kids a well planned non-vegan diet isn't necessarily easy either. semi-vegetarianism - might eat fish or chicken, etc. Of course, the fewer foods you restrict, the easier it will be to follow and plan your child's vegetarian diet. Not all substitutes for cow's milk are fortified with vitamin B12. Becoming a vegetarian doesn't mean that you have to only eat organic foods. The AAP states that "No direct evidence of a clinically relevant nutritional difference between organic and conventional produce exists." Like adults, teens may become vegetarian for health, moral, or religious reasons. Some teens become vegetarian impulsively, though, and some do it to hide an eating disorder. There are many fortified foods available in the average grocery store that make it easier to raise a vegetarian child than when Dr. Spock first made his recommendation. A registered dietician can help you plan your vegetarian child's diet, which can be an especially good idea if you are raising a vegetarian infant or toddler. And remember that the American Dietetic Association states that "Well-planned vegetarian diets are appropriate for individuals during all stages of the life cycle, including pregnancy, lactation, infancy, childhood, and adolescence, and for athletes." American Academy of Pediatrics Clinical Report. Organic Foods: Health and Environmental Advantages and Disadvantages. Pediatrics Vol. 130 No. 5 November 1, 2012 pp. e1406-e1415. American Dietetic Association Position Paper. Vegetarian Diets. Volume 109, Issue 7, Pages 1266-1282 (July 2009). Asher, K. Study of current and former vegetarians and vegans: Qualitative findings. Olympia, WA: Faunalytics. Renda, Meredith MD. Vegetarian Diets in Children and Adolescents. Pediatr. Rev. 2009; 30:e1-e8.